However, there are many descendants still living of some of Laura's cousins, and now you have an opportunity to meet some of them! For a few months in 1891-1892, Laura, Almanzo, and Rose lived in Holmes County, Florida, with Peter Ingalls and his family -- "Cousin Peter" from Little House in the Big Woods and The First Four Years. Another cousin, Joseph Quiner Carpenter (not mentioned in the books, but he is the son of Ma's and Aunt Eliza's sister Martha) also owned land nearby. Peter's grandson still owns the family land in Westville, Florida, and a historical marker commemorates the site where Peter's home formerly stood. The third annual Ingalls Family and Friends Reunion Picnic will be held on the Peter Ingalls farm from 10 am to 2 pm on Saturday, October 18. The grandchildren and great-grandchildren of Peter Ingalls will be in attendance. 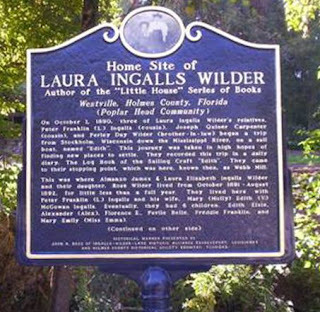 You are welcome to attend this picnic, see the historical marker, and visit with other Laura fans and the Ingalls family. While in the area, you may also wish to visit the Mt. Ida Church where Laura and Almanzo attended, along with the Peter Ingalls family. Beside the church is the cemetery where Peter, his wife Mary ("Molly") and one son, Alex, are buried. For more information, including directions to the farm, please contact John Bass at JohnBass@aol.com. well why can't you go? Are you in prison or paralyzed? If not, you can go.